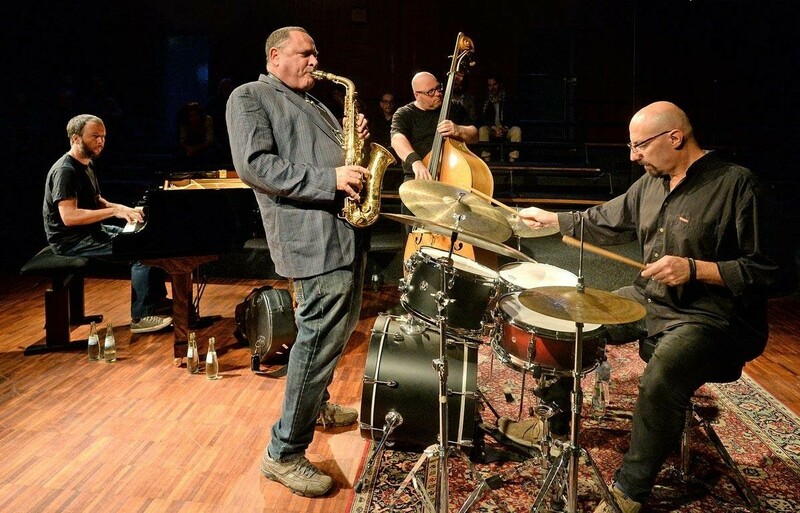 The constantly touring sax supremo Gilad Atzmon, who The Times once described as ‘the hardest gigging man in British jazz’ leads this excellent band paying homage to one of the greatest jazzmen of all time with ‘The Spirit of Trane’. Born in Israel but based in the UK for over twenty five years, the multi-talented Gilad Atzmon who is best known as a saxophonist and composer is also a prolific author and political activist. His philosophy and music have always sought to surmount boundaries and barriers and encompass different cultures. As a leader he has fronted his regular working band The Orient House Ensemble since 2000. Frank Harrison took up the piano at 11 and began playing gigs when he was 15. At 16 he won the soloist award in the Daily Telegraph Young Jazz Competition, and at 18 was placed second in Young Jazz Musician Of The Year. After taking up a scholarship at Berklee School Of Music, Boston, he returned to England and joined Gilad Atzmon’s band. In 2000 they started the Orient House Ensemble, with whom Frank has recorded eight albums, including BBC Jazz Album Of The Year 2003, “Exile”. Double bass player Yaron Stafi studied music in his native Israel before continuing his studies at the Berlin Academy of Arts, and in both those countries he was a member of various youth classical orchestras. In 2002 he moved to London and joined Gilad Atzmon as a member of the Orient House Ensemble, but also plays in various other jazz bands in the UK and Europe. Enzo Zirilli started as a drummer in Rock and Rhythm & Blues bands before moving into jazz. He came from Italy to London in 2003 where he started playing with many different big names on the London jazz circuit as well as leading his own band.